To make a great pizza you need a pizza stone and a pizza peel. I use Bobby Flay’s recipe for dough and it comes out great every time. 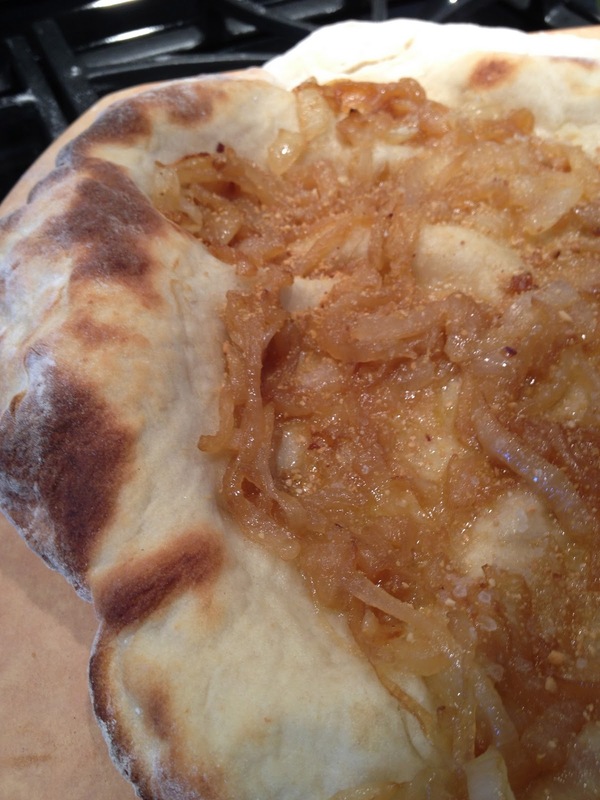 Tonight we had caramelized onion pizza topped with Candle 79’s Cashew Parmesan. Combine the bread flour, sugar, yeast, and salt in the bowl of a stand mixer and combine While the mixer is running, add the water and 2 tablespoons of olive oil and beat until dough forms a ball. If too dry, add more water 1 tablespoon at a time; if too wet, add more flour 1 tablespoon at a time. Scrape dough onto a floured surface and gently knead into a smooth, firm ball. Grease a large bowl with olive oil and place the dough in the bowl. Cover with plastic wrap and put in a warm area and let it double in size, about an hour. Turn the dough out onto a floured surface and divide into 2 to 4 pieces. Cover with a clean kitchen towel and let rest for 10 minutes. To caramelize the onions, cut the onion in half and then into semi circles. Cook in olive oil on medium heat for at least 30 minutes. Stir occasionally. Cover to make it go faster. Salt toward the end. Place your pizza stone in the oven and preheat to 500. Let it sit at 500 for at least 10 minutes before you put your pizza in. Roll out the dough. Make sure there is flour on the rolling pin and the work surface. Put some flour on a pizza peel and transfer the dough onto it. Poke a few holes with a fork. Place dough in the oven for a few minutes to cook by itself. Using the pizza peel, take the dough out and brush with olive oil. Spread out the caramelized onions and place back into the oven. When the crust is puffy and looking like pizza, take it out and top with salt and Cashew Parmesan.